Last weekend, I held another sold-out workshop at Fox in Sydney, and, as is usually the case at my workshops, I found a new way of presenting an idea that helped me grasp it better. And I'd like to share it with you. You've probably heard it before, but there's a phrase that goes like this: "All Drama is Conflict". One of the mistakes writers often make is overlooking (or misunderstanding) this simple idea. We frequently read screenplays that don't have enough conflict. And when that happens, it means a dull read. Read the phrase again and let it sink in. It doesn't say "All Drama has a lot of Conflict". It says All Drama IS Conflict. It goes to the very heart and essence of storytelling. Conflict is the very nature of drama, and without it, there simply is no story. Nothing's happening. Consider the last story you wrote, or the last scene you hammered out. Was it built entirely around conflict? Was the whole point of the scene to show two or more characters at odds with one another (at least on some level), or a character at odds with herself? When you re-read your work, do you ever wonder why it just doesn't "sing"? Is it flat or dull or seem like something's wrong, and it's just not going anywhere? Here's a tip that took me ages to really understand: When you put characters in conflict with one another, the audience is drawn to it. They can't help but watch an interesting conflict! And if you don't believe me, consider the last time you saw a couple on the street having an argument. Your instinctive reaction was to look, maybe even to watch. The point is this: They are NOT separate things. Drama IS conflict. So the quickest way to spice up your story is to add another layer of conflict. Person A wants something, but Person B stands in his way (or wants it too!). We're not talking about a few major scenes. We're talking about everything! 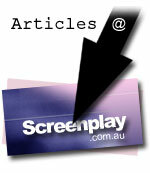 Your logline needs it, your synopsis needs it, your treatment needs it, and your screenplay needs it. On every page. In every scene. In every story. Because that's what storytelling is all about. Now get out there and create some conflict! This article is copyright © 2003 by Jeff Bollow, and may not be reprinted without permission. You are free to link to this page, provided it is not within a frame on an external site.